The MARK of the BEAST... it is here, NOW! "And I saw another sign in heaven, great and marvelous seven angels having the seven last plagues; for in them is filled up the wrath of God... And the seven angels came out of the temple, having the seven plagues,... And I heard a great voice out of the temple saying to the seven angels, Go your ways, and pour out the vials of the WRATH OF GOD upon the earth. And the first went, and poured out his vial upon the earth; and there fell a noisome and grievous sore upon the men which had the mark of the beast, and upon them which worshipped his image" (Rev. 15:1, 6, and 16:1-2). But let's look at all the facts God reveals on the subject, all the scriptures bearing on it. What is this weird "beast"? 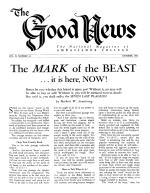 An astounding booklet "Who Is The BEAST?" identifies this wild animal — a composite wild animal with the strongest characteristics of the four wild animals symbolically described in Daniel seven — as the Roman Empire. Space does not permit that full identification here. It took over, exercised, wielded, all the power of the first beast — the Roman Empire. After 554 A.D., the Roman Church did do this for 1260 years, as prophesied! "And he had power to give life unto the image of the beast, that the image of the beast should both speak, and cause that as many as would not worship the image of the beast should be killed. And he causeth all,... to receive a mark in their right hand, or in their foreheads" (Rev. 13:15-16). You dear reader, must soon choose whom you will obey — this coming Roman Empire resurrected by a United States of EUROPE, ruled by traditional Christianity — or whether you shall OBEY GOD! Notice it also in the prophecies of the Old Testament: "The great day of the Eternal [time of God's wrath — the last plagues] is near... that day is a day of wrath, a day of trouble and distress... and I [God] will bring distress upon men, that they shall walk like blind men [the plagues! But why?] because they have sinned against the Eternal" (Zeph. 1:14-17). What is sin? There is only one possible Commandment — the one regarded by the largest number as the "LEAST" of the Commandments — and that is the fourth Commandment, which says: "REMEMBER the Sabbath day, to keep it holy... The seventh day is the Sabbath of the Eternal thy God." It was for obeying God's FOURTH Commandment — keeping the Sabbath — that millions were put to death. The local Council of Laodicea, in 363 A.D., passed this decree: "Christians must not Judaize by resting on the Sabbath, but must work on that day, resting rather on Sunday. But, if any be found to be Judaizing, let them be declared anathema from Christ." Now the "beast," in association with the Church, used FORCE to brand the western world with their MARK. Those who obeyed God and kept His Sabbath were martyred. They were unable to "buy or sell." But God does not force anyone. God says, "Whosoever will may come." God lets us make our own decision about obeying Him, accepting Christ, and becoming His obedient children. "And the Eternal spake unto Moses, saying, Verily MY SABBATHS ye shall keep; for it is a SIGN between me and you throughout your generations." These generations of Israel (see our free booklet, "United States in Prophecy,") are still going on! Now WHY is it a sign? Does it IDENTIFY God to us? Does it identify us as HIS? "... that ye may know that I am the Eternal that doth sanctify you." It is a SIGN, that we may KNOW that the Eternal is the true God. It identifies who God is. How? Notice verse 17: "It is a SIGN... for in six days the Eternal made heaven and earth, and on the seventh day he rested, and was refreshed." It is the memorial of God's rest from CREATION. Always, in all parts of the Bible, God identifies Himself as CREATOR. How can we distinguish who is the TRUE God, from all the false gods? The true God created all the false gods, and that from which they are made, and everything that is. Some worshipped the sun. But the Eternal, the true God, created the sun, and rules it. Some worship idols carved out of stone, or wood, or marble. But the true God created that from which they were made, and even the human beings who made them. The Sabbath is GOD'S Sabbath, not the Jewish Sabbath. Never does the Bible call it the "Jewish Sabbath." It identifies GOD as the CREATOR. But back to Exodus 31:17-18. It also is the SIGN by which we are identified as belonging to GOD. We BELONG to whom we obey — so we read in Romans! It is the sign by which we know He is the ETERNAL... "that doth sanctify YOU." To sanctify is to set apart for spiritual use. The SABBATH sets one apart from the world, and always did — as OBEYING and belonging to GOD. Can you think of ANY REASON why anyone would EVER keep the Sabbath, except to OBEY GOD? Would any man defy human custom and invite persecution, and be set apart as different, through human reason? Could any atheist be a Sabbath keeper? THE SABBATH IDENTIFIES GOD'S PEOPLE! "He that despised Moses' law died without mercy under two or three witnesses: of how much sorer punishment, suppose ye, shall he be thought worthy, who hath trodden under foot the Son of God...?" (Heb. 10:28-29). Deut. 6:1, 6-8: "Now these are the COMMANDMENTS... and these words, which I command thee this day, shall be in thine heart... and thou shalt bind them for a SIGN upon thine hand, and they shall be as frontlets between thine eyes." Deut. 11:18: "Therefore shall ye lay up these my words in your heart and in your soul, and bind them for a SIGN upon your hand, that they may be as frontlets between your eyes." The Roman Catholic Church did cause all under the "Holy Roman Empire" to receive this "mark," during the middle ages. Has she stopped? Just at present she has not the POWER to enforce this mark on everyone. Just at present she has not the POWER to enforce this mark on everyone. But our men in Europe this past summer saw the BEAST rising for the last time out of its symbolic "bottomless pit." It will be a United Nations of EUROPE — a union of ten nations. It will be a UNION of Church and State — and the Roman Catholic Church once again will sit astride "The BEAST."